Product #45435 | SKU SC2 | 0.0 (no ratings yet) Thanks for your rating! 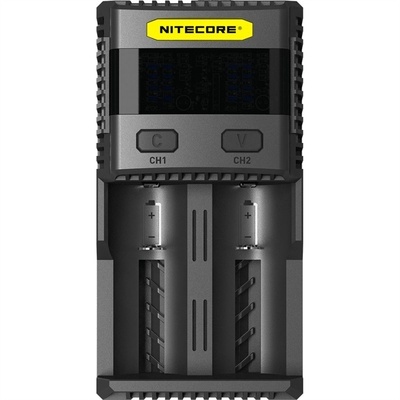 The dual-bay SC2 Superb Battery Charger from Nitecore is a versatile charger for most rechargeable battery chemistries including lithium manganese oxide (IMR), lithium-ion and lithium iron phosphate (LiFePO4). An intelligent power management system automatically detects the number of batteries installed, evenly distributes charging power, and selects the appropriate charging current based on the specific needs of each battery installed. Besides charging batteries, this charger also provides output power from a standard USB port to charge small electronics such as smartphones. LEDs clearly display the charging status and power level of each battery, and output selection. Reverse polarity and over-charge protection, as well as short circuit and non-rechargeable battery detection, prevents damage to the batteries and charger.